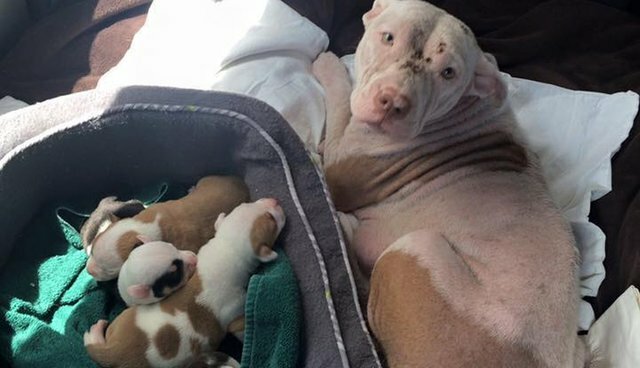 Dory, an extremely pregnant dog who was being kept chained up and used for breeding in Florida, was rescued just in time to have her babies. What her rescuers didn't realize at first was that her daughter, Destiny, was also pregnant and in need of help. Big Hearts for Big Dogs Rescue (BHBD) saved Dory from her life of breeding and helped her give birth to eight puppies: five boys and three girls. Unfortunately, Dory was not the only dog the family had used for breeding - Destiny also fell victim to the same fate. "People in the area had been keeping an eye on them after Dory [was rescued] and we were alerted that Destiny had gone into the woods to have puppies on the same exact day that Dory delivered her babies," Trinity, West Coast director of BHBD, told The Dodo. 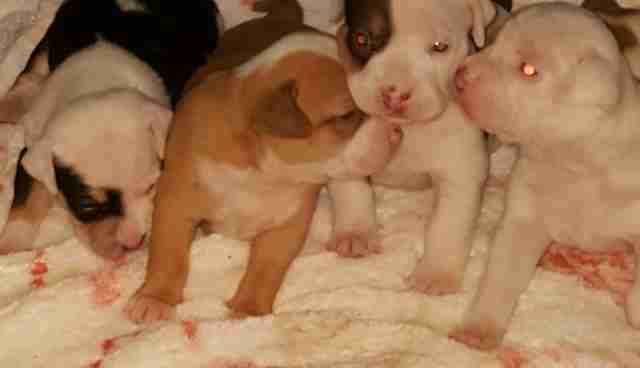 "Dory's foster mom and volunteers searched and found her with four living and several deceased puppies. The owner agreed to surrender the family to BHBD." When the little family was found, they weren't in the greatest shape. 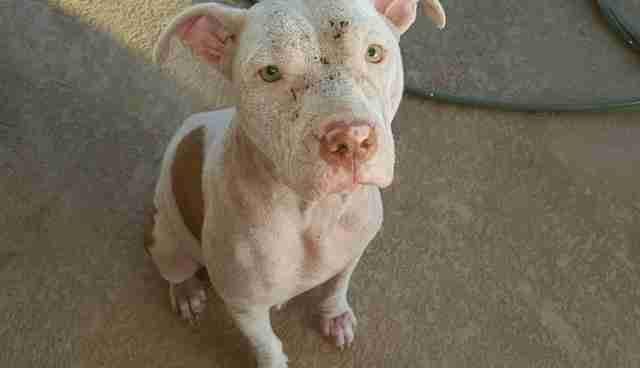 Destiny had mange, and her puppies were covered in fleas and ticks. While physically Destiny wasn't doing very well, emotionally she was even worse. The poor dog clearly didn't trust humans, and had no idea what was going to happen to her and her babies. "She is very shy, sweet and quiet," Trinity said. 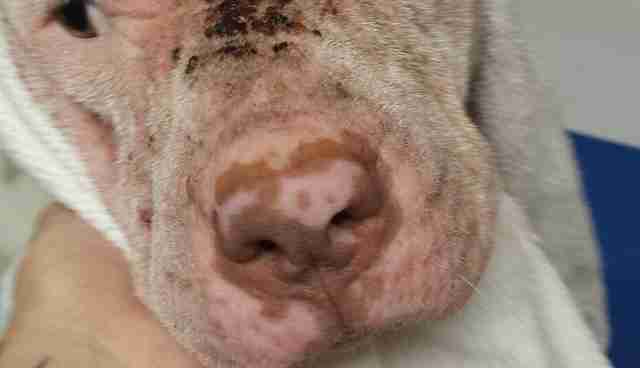 "It is apparent she has not had it easy and is very unsure of humans." Destiny's four surviving babies are all girls, and have been named Bailey, Pearl, Coral and Peach. She's been an incredible mother so far, and keeps a close eye on her girls to make sure they're always safe. Once Destiny and her babies were safe and healthy, her rescuers gave her yet another gift - a reunion with her mom, Dory. 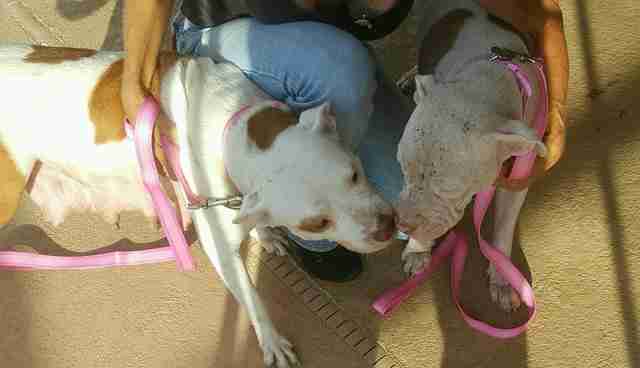 "They were reunited and they just licked and licked each other," Trinity said. "We were fortunate enough that Dory's foster mom made room for Destiny and her babies too so they are weaning their puppies together." Many pit bull moms just like Destiny end up in shelters every day after being bred repeatedly. To help other pit bull moms in need, you can donate to Big Hearts for Big Dogs Rescue.